What do roads we drive on, a bottle of ketchup, a can of cola, and a custom-designed wedding band have in common? In addition to the items listed, almost all of what we use, and in some cases even wear, has been touched in some way by a tool made from tungsten carbide. From the dies and cutters used to make things such as toiletries, bottles, and your can of cola,; to the wear resistant items used to process food like ketchup and spaghetti sauce; to the tools like road construction bits used to dig up the asphalt and cement on our roads; drills and end mills used to cut metal to make car parts like engine blocks, pistons, brakes, gears, etc., tungsten carbide is a common link amongst all. Tungsten carbide is often used as a generic term for the composite material containing hard particles composed of tungsten carbide, along with softer, metallic binder material used to hold the particles in place. It is a very hard and dense material, generally used to form and shape other materials in processes like forging and machining. Did You Know? The strength of tungsten carbide in compression, where the forces are trying to squeeze the atoms closer together, is the highest of any material that is known. Tungsten carbide revolutionized the ability to machine metals like steel, titanium, and nickel alloys to create complex parts that helped pave the way for the technical revolution of the past 100+years. What Are The Properties of Tungsten Carbide? 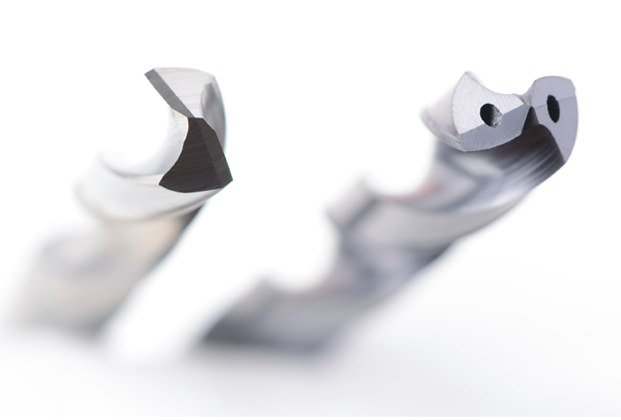 Combined with its high thermal conductivity, extremely high strength (especially in compression), and extremely high stiffness, tungsten carbide is the choice material for all types of metal forming and cutting tools. Tungsten carbide’s properties also provide the requirements for other types of wear parts such as the large dies and punches used to create synthetic diamonds. This diamond process requires extremely high pressures, along with high temperatures, making tungsten carbide the only material choice in this application. Did You Know? Kennametal was founded in 1938 based on an invention for improving the properties of tungsten carbide, which enabled a significant increase in productivity for the machining of steel. The remarkable properties of tungsten carbide include a hardness that is approaching that of diamond — the hardest material known to man. Remember the custom-designed wedding band we mentioned earlier? Wedding bands, and all other forms of tungsten jewelry, are actually composed of tungsten carbide. With high resistance to local deformation, a ring made of tungsten carbide not only offers extreme strength, but protection against scratching, as well. Wondering how this rare, extremely dense, ceramic/metallic material with an extremely high melting point is actually made? Good news: We’re tackling this question the next time around. Kennametal Innovations Ventures Group (IVG) will continue our Tungsten Carbide Series with articles featuring: The manufacturing of tungsten carbide powder, how tungsten carbide powder plays a role in 3D Printing, and much more! Seeking a quote on our wide range of Firth Sterling Tungsten Powders, Tungsten Carbide Powders, or Ready-to-Press Powders? Visit here.